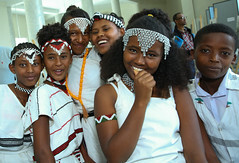 According to the 2016 Ethiopian Demographic Health Survey (EDHS), FGM/C among the age group of 15-49 is most prevalent among the ethnic groups of Afar and Somali regions (98 per cent and 99 percent, respectively), followed by Welaita and Hadiya (92 per cent for both). In addition, 54 per cent of urban women have experienced FGM/C as compared to 68 per cent in rural areas. FGM/C is less prevalent among women with higher education and those in the highest wealth quintile. The 2016 EDHS shows a decreasing trend in FGM/C nationwide with the prevalence in 15-19 year olds down to 47 per cent as compared to 65 per cent in the 15-49 age group. UNICEF supports the Government’s efforts through enhancing capacity to implement both preventive and responsive programmes at scale, and strengthening coordination mechanisms at different levels. 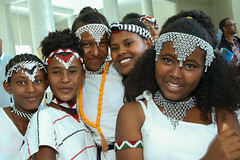 UNICEF works with the National Alliance to progress ongoing roadmap development to end FGM/C and Child Marriage. It also, supports the involvement of faith based, traditional and community leaders, as communities usually link this harmful traditional practice to cultural and religious norms. 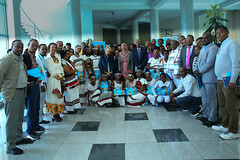 In this regard, UNICEF signed a Memorandum of Understanding (MoU) in August 2016 with major religious institutions in the country to improve the lives of children, women and adolescents by promoting positive behaviour and social norms and to bring about the necessary societal shifts in communities. UNICEF supports the Government in the health sector in the Afar and Somali regions to address FGM/C related complications by providing training to health workers; raising the communities’ awareness on health risks caused by FGM/C; identifying girls and women affected by FGM/C; developing training materials; recruiting gynaecologists and equipping selected hospitals with basic FGM/C care equipment.